Do you like burgers and Billy Bob Thornton? 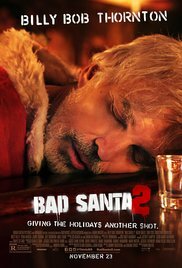 Send us the name of a great Winnipeg burger restaurant to enter to win one of ten double passes to the advance screening of Bad Santa 2. The catch is, it has to be a restaurant we haven’t reviewed yet. To enter, go to Burger Club - Winnipeg and use the Contact Form to submit the restaurant name. One vote per person. A random draw will occur Nov 4. Advance Screening: Monday, November 21st – Scotiabank Theatre - 7:30 pm. Watch the trailer here. Release Date: Wednesday, November 23rd. See the poster here. any passes left? just saw this, very interested! Sorry, the passes have all been handed out. Don't care about the passes, you guys need dairy delight on st.annes rd. In your lives!